This report drills down to identify the cause of our ongoing global economic disequilibrium, and further seeks to identify where alpha in the equity market may be found today. I argue the fundamental disconnect is unnatural clearing levels – prices of goods, services and assets that do not reflect societies’ sustainable needs, wants and preferences – and that in such an environment capital structures of businesses producing demand-inelastic global resources, goods and services must effectively behave as sovereign currencies. I further argue the currency-adjusted real values of most leveraged assets and productive assets are not accurately reflected in their relative nominal price levels currently. The former is far too high relative to the latter. A few years ago, the smart people at Pimco coined the term «new normal» to help describe the increasingly obvious need for ongoing unconventional economic policy directives in over-leveraged, finance-based economies, and the impact on global production they would have. The Firm later helped promote the concept of a «stable disequilibrium» – a tenuous economic state that, if left in place too long, could lead to deteriorating and wholly a-cyclical economic consequences. This past August, Pimco’s Mohamed El-Erian seemed to publicly join his colleague, Bill Gross, in conceding the new normal had further morphed into a state in which global economies and policy makers are going to have to come face to face with the sources of this disequilibria. In this report, I will narrow this reconciliation theme to what I see as the base source of our increasingly not-so-stable disequilibrium – unsustainable global price levels – and then take a logical next step to make the case for where global wealth will flow – towards direct ownership in resources and the corporate capital structures of businesses with sustainable pricing power. My conclusion: claims on production and demand-inelastic global resources are now the ultimate sovereign currency, regardless of their provenance, and this is where substantial alpha resides in today’s equity markets. Economies are meant to be naturally-functioning processes that organize societies (think efficient allocation of resources), and financial markets are supposed to exist to help form, distribute and price capital. Today, however, it seems clear that externalities are distorting these functions. Aggressive economic policy interventions are disrupting basic commercial incentives to consume and invest. While such exogenous inputs have greatly influenced such incentives for decades, they seem to be quickly losing their efficacy, as they would ultimately have to in the latter stages of their aggressive applications. The fundamental disconnect today is unnatural clearing levels — prices of goods, services and assets that do not reflect societies’ sustainable needs, wants and preferences. 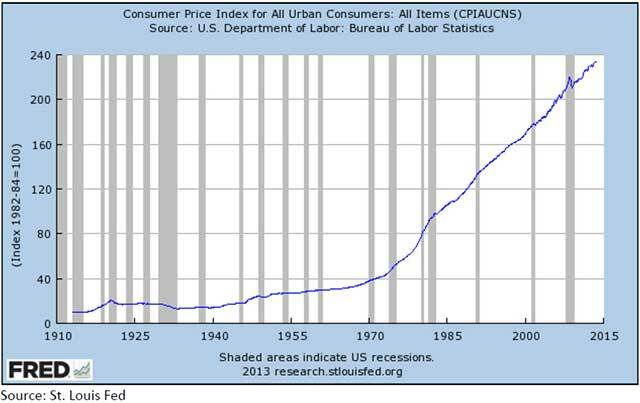 If left to an economy’s natural functioning, goods and service price levels would fall over time as input prices fall, which would occur naturally as the rate of innovation and productivity outpaces population growth. However, a falling general price level is unacceptable to policy makers in finance-based economies where ever-rising prices are needed to service and collateralize ever-increasing debt levels. So, global monetary authorities have sought «price stability,»which in practice implies the need for constant price inflation to offset what would otherwise be naturally-occurring price deflation. Indeed, «price stability» has become a bipartisan, socially acceptable euphemism for consistent policy- administered credit and price inflation — functionally the diminution of a currency’s purchasing power. Implicit in the consistently rising slope of CPI inflation on the graph, the purchasing power of $1.00 has declined by about 59% since 1983. To be clear, this means that one who saved a dollar truly RISK-FREE (i.e., under the mattress) over the last thirty years would have about forty-one cents of her original purchasing power today. Most contemporary economists would argue that such analysis is incomplete and misleading because savers have mostly lent their money and received interest on their savings in excess of their purchasing power loss. This is true, but also misleading and incomplete. Since 1983, implied yields on twelve-month US T-bills have averaged about 5.00% while US CPI has averaged about 2.9%. 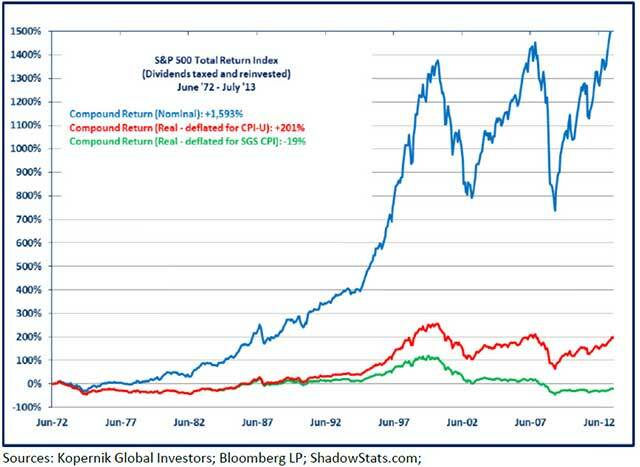 This suggests a positive average annual real return of about 2.1%. Keeping our logic constant then, the purchasing power of $1.00 invested in T-bills in 1983 and rolled-over every year would have grown to about $1.87 — an overall positive real return on one-year T-bills. But consider this: T-bills over the last thirty years were never risk-free in aggregate, when adjusted for the inevitable need to reduce the Dollar’s purchasing power. The positive gains were gamed from issuing claims on money that did not yet exist in the system. Had there been no exogenous monetary authority willing and able to manage USD credit pricing, it is likely the market would have set real returns on government issued obligations either far higher, as the US Treasury ran up significant deficits, or, less likely, far lower as Treasury would not have been able to run up deficits in the first place. So, the positive real return of «risk-free assets» over the last thirty years was in fact the result of a speculation that had to ultimately end and be reversed — if not nominally then in real terms (i.e., currency devaluation). Implicit in the ability of virtually everyone in society to have received a positive real return on the money they loaned «risk-free» to the US Treasury, as appeared to occur from the early eighties to very recently, was a false reality based on the misperception that lending generally creates capital — the means for sustainable economic expansion, and that the loans created would ultimately be extinguished. Sustainable capital formation is not complete until the credit and debt created are retired and only the capital remains. As we know, systemic debt has become the economic equivalent of a bad houseguest. Each dollar loaned by savers demands a dollar of production on the other side, plus production growth equal at least to the interest rate received. This is needed so that the borrower can service and repay the loan. Otherwise, the dollar’s PURCHASING POWER cannot be returned to the lender. For most of the last thirty years, global policy makers overseeing bank credit, led by the Fed, have generally maintained easy credit conditions. (We know this simply because aggregate credit has risen consistently.) Easy credit was accomplished by keeping real returns to «savers» (in the form of interest rates)higher than the potential increase in sustainable real economic production derived from those savers’ loans (to banks as deposits or directly to borrowers through asset-backed securities markets). Think of it this way: the real return on bank deposits and ABS has been consistently higher than the sustainable(debt-adjusted) real return on the collateral they funded. Savers had incentive to lend. And so secularly easy credit policies served to expand nominal production at the expense of maintaining the sustainable purchasing power of all established major currencies. Securitized market debt created over the last thirty years remains and has been collateralized by asset values that, in turn, rely upon ever- growing further dilution of the very currencies in which they are denominated. Meanwhile, loans to global banks (i.e., deposits and central bank loans) have been woefully unreserved with base money. At some point, the credit markets would have to seize, and they effectively have. The Fed has become the rate setter for benchmark «risk-free» global interest rates. It is de-levering American banks directly by creating reserves and backstopping foreign banks by promising necessary swap facilities. Meanwhile, there has been a general misperception that zero-bound short-term interest rates have been promoted by the Fed as economic stimulus. As we have seen, however, Quantitative Easing has had little bearing on production because it helps only institutions not directly productive. Banks produce little, if any, capital directly. Creating new bank reserves for very fractionally-reserved banks only serves to delever their balance sheets. QE also helps fund the US government, which is not directly productive either. Government revenues are derived mostly from taxes on production of the private sector. Balance sheets of the productive non-financial private sector are not being de-levered by any external body creating new base money. If they are to be de-levered it must be the result of pure economic reasoning — debt-to-asset and/or debt-to-income levels are too high. Indeed, the factors of production have been de-levering, which tells us there remains no commercial incentive (profit-oriented motivation) to borrow. Why? It must be because assets are not cheap enough and potential income from borrowing is not high enough in real terms. Meanwhile, nominal asset prices are generally rising in over-levered economies where capital production is suffering. Again, consider credit. Zero-bound interest rates imply little, if any, future upside for the value of credit, which in turn provides little prospect of beneficially refinancing debt that collateralizes assets. This implies that asset values must increase in real terms looking forward or else owning them would destroy wealth. Yet, positive real returns for most levered assets are unavailable today as the rate of currency dilution exceeds the rate of production growth. In this environment, the numeraire that defines asset prices and the general price level is unimportant; real value is the thing. Unencumbered assets are generally more apt to hold their purchasing power value, as are businesses that provide goods and services to customers that do not have to borrow to spend. The currency-adjusted real values of most leveraged assets and sustainably productive assets are not accurately reflected in their relative nominal price levels currently. The former is far too high relative to the latter. It is reasonable to expect savers and investors to begin recognizing how and where wealth must be stored looking forward — in sustainable resources and businesses with sustainable pricing power. Judging by the popular composition of asset sponsorship currently, this thesis requires a change in popular sentiment, the timing of which is difficult to anticipate. However, I see timing as the only risk because a significant change in popular sentiment only has to follow already well-established macroeconomic trends. Fundamentally, it is a case of information arbitrage. It is becoming increasingly obvious to a growing number of observers (albeit still a small bunch) that real output — currency inflation-adjusted GDP — cannot be pulled forward through further credit or currency creation. As noted, one who saved for most of the last thirty years by lending to a treasury, municipality, bank (in the form of a deposit), corporation, or to another private borrower (e.g. to a home buyer through the MBS market), would have received a higher rate of interest than the loss of purchasing power of her dollar — a positive real (inflation-adjusted) return. What many savers continuing to make such loans seem to not understand, however, is that by continuing to lend to governments, private borrowers, banks, etc. they are locking-in the likelihood that they will not be repaid with equal purchasing power. The only market participants with a rational reason to own sovereign or tertiary debt with negative real return profiles today are levered entities able to make a positive nominal spread on their holdings. Banks and other entities that can borrow ten- or twenty-times their equity and take-out 0.25% per bond, and that do not care (or are not forced to care) about the purchasing power of any of the bonds in their arbitrage, have no structural incentive to complain about negative real rates (let alone sell their bonds). What is rational for them is not rational for most savers and investors. The graph above tells an interesting story. Nominal GDP («NGDP») represents US production growth; Total Credit Market Debt represents the growth of systemic USD-denominated debt; and USD base month growth (USD currency in float and bank reserves supporting systemic USD credit) represents the monetary denominator off which systemic credit and debt exist. In short, the graph shows past and current systemic USD leverage. The takeaway is that the high line (public credit/debt) is ultimately supported by the integrity of the low line (actual money), while policy makers are wondering how to maintain the trajectory of the middle line (so that the high line does not collapse or they do not have to suddenly create boatloads more base money, which would make the low line rise parabolically). The leverage portrayed here is the basis for the warped general price level, which in turn is the basis for global economic disequilibrium. To be fair, unlike the «unreserved credit» in the fractionally reserved banking system, much of the credit supporting the high line on the graph is actually collateralized by private sector assets. However, to be even more fair (s), reconciling this debt would require asset sales. To whom would we sell them to maintain their market values and the value of our debt and collateral: each other? Needless to say, widespread asset liquidation to service and repay outstanding debt, which would drive down asset prices to reflect their un-levered (currency-adjusted) sustainable values, would be a very sub­optimal social, economic and political occurrence. 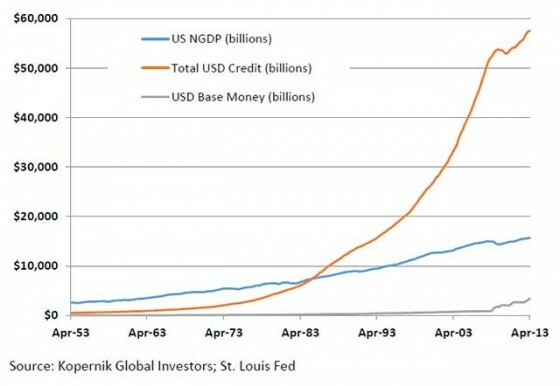 The good news is that, unlike the 1930s, it is an occurrence that need not occur given the ability of monetary authorities in the current (forty year-old) regime to create infinite base money for all debtors (not just banks). So, it seems reasonable to expect fiscal and monetary authorities with direct access to a printing press to choose inflation over austerity. Flash forward to today: Japan is overtly destroying the purchasing power of the Yen to target NOMINAL GDP. Meanwhile, Washington is increasing public spending and attendant debt ceilings, and forcing the Fed to continue QE so government can continue subsidizing diminishing economic incentives in the private sector. The point here is that we have a very well-established roadmap and a very well-established inflation trend and yet the public does not seem to get it yet. There is a popular misunderstanding that the great majority of savings and investments are collateralized in currencies that are not being diluted and do not have to be greatly diluted in the future. The Fed will have to increase QE (not taper it) because systemic debt is compounding faster than production and interest rates are already zero-bound. My colleague, Lee Quaintance, noted many years ago that the Fed was holding a burning match. This remains true today (only it is a bomb with a short fuse). Thirteen years after the over-levered US equity market collapsed, eleven years following Bernanke’s speech, five years after the over-levered housing bubble burst, and four years into the necessary onset of global Zero Interest Rate Policies and Long-Term Refinancing Operations, global monetary authorities seem to have run out of new outlets for credit. In real economic terms, central bank policies have become ineffective. 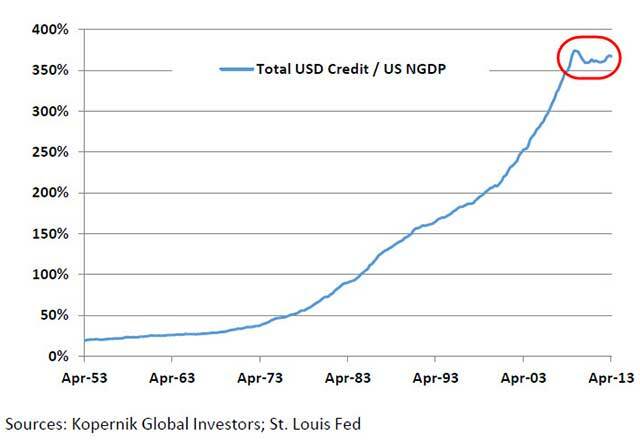 The graph below divides two lines on the graph above, Total USD Public Credit by US nominal GDP. The high plateau to the right suggests that ever-increasing credit growth is struggling to maintain economic production. In other words, the US is now producing as much new debt as goods and services. The elephant in the room is that while economic policies that target rising nominal GDP may make it easier to service outstanding debt (if NGDP rises from demand growth rather than price inflation), they do not make it easier to repay that debt. Indeed, NGDP growth is mildly positive today while real economic activity, as seen through money velocity (below), is plummeting. 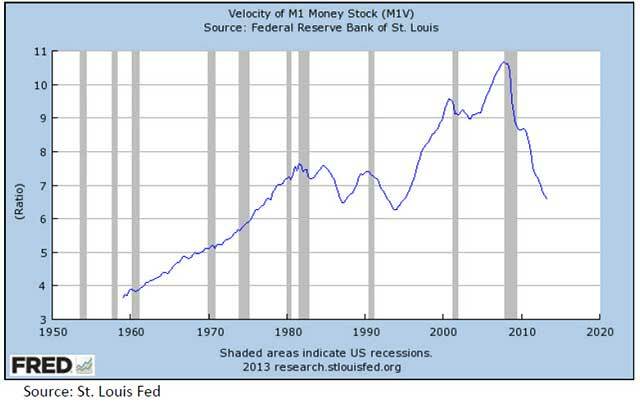 By increasing bank reserves through QE, the Fed has been de-levering the formerly almost completely unreserved stock of USD checkbook money (M1, M2, M3) — now about 8:1 checkbook money-to-bank reserves. This is better collateralizing bank assets (i.e., loan books), and that’s it. It is not directly economically stimulative. Perhaps more troubling than the obvious dearth of credit money to feed contemporaneous economic activity is the erroneous perception among most influential economists and policy makers that all is well as long as debt is kept low in relation to an economy’s output. Such analysis mixes accounting identities and produces a too-sanguine conclusion. Debt obligations are first claims on checkbook money, which in turn are ultimately claims on base money (bank reserves and currency in float). Debt obligations are not claims on widgets. And so while Debt-to-GDP charts like the one below are often cited by policy makers when analyzing economic sustainability, they miss the point entirely. 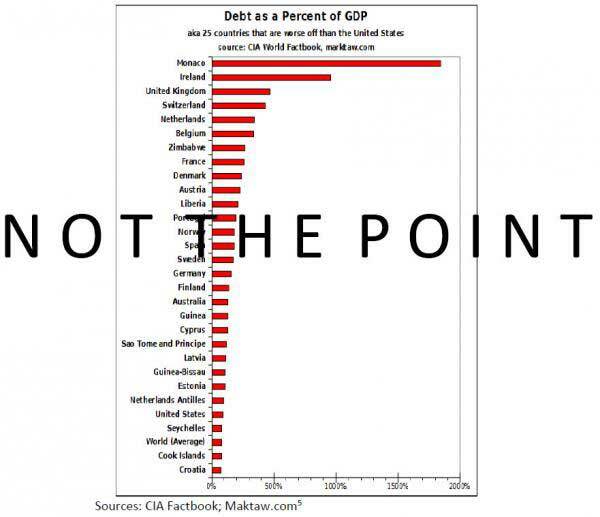 Beyond confusing accounting identities (a debt is formally a claim on currency rather than a claim on production), Debt-to-GDP ratios also tend to count only federal debt (not including off-balance sheet obligations). Relying on debt-to-GDP metrics demonstrates more concern with the viability of government balance sheets and future government spending than with private sector investment in plant, equipment and labor. Whether readers believe in big government, small government, efficient government or no government, we should all agree that self-important governments, government economists, and most academic economists trained to comply with government economic policy are ignoring the most basic principle of economics: economies naturally economize. Within this context, declining rates of private sector investment make sense currently in finance-based economies where businesses and households have natural incentives to husband resources and reduce outlays — to de-lever their balance sheets. It is impossible to de-lever a balance sheet without either increasing assets or decreasing debts. Where is the incentive to take risk, to re-lever and expand? In other words, the productive economy is risk-off. There is diminishing incentive to produce. Meanwhile, the financial economy is risk-on. 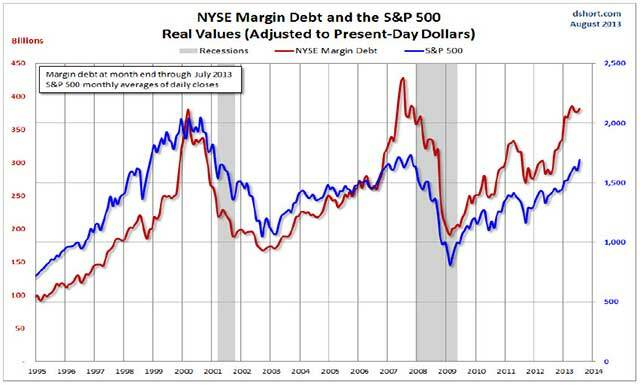 The S&P 500 has added $4 trillion of market cap this year on the back of corporate and margin debt. As the graph below shows, the stock market seems to be the chosen outlet for the bank multiplier effect — using bank reserves to collateralize new loans. (This clearly explains widening wealth and income gaps in an environment of widespread malaise.) The takeaway here is that real, currency-adjusted value within the stock market is being overlooked as indexes rise in nominal terms. As many have noted (e.g., Churchill. Eban), people and nations tend to find the right path after they exhaust all others. Policy makers and ne’er do well economists are still trying to find solutions to increase nominal aggregate demand that would justify the risk-on financial economy. However, even if they succeed in increasing NGDP, they will likely fail in pulling the global economy out of its current disequilibrium. Policy makers cannot (and will not be able to) find a solution that increases aggregate real demand and real output because their toolbox has been reduced to printing presses and carefully parsed communications; neither of which provide the factors of production incentive to produce more. The US and other highly-levered economies cannot grow out of the leverage problems stifling production unless they do so without incurring new debt, and there is no obvious new capital forming outlet for further credit/debt assumption. So, rather than allowing aggregate economies to de-lever on their own, central banks and governments are assuming the debts the private sector no longer wants or can afford to carry. This exercise is propping up the appearance of economic growth (NGDP) and low coincident inflation (CPI), and encouraging some capital market investors to leverage their holdings. Policy-administered inflation on the back of already-levered balance sheets and zero-bound interest rates is sinking governments and central banks deeper into an irreconcilable compounding debt trap that must end either in nominal insolvencies or in significant currency devaluations (a currency default in real terms). As discussed, it seems a far better bet to side with the latter outcome, which would ensure the loss of significant purchasing power for savers of those currencies and for investors in many levered financial assets denominated in them. The public debate in which most investors, policy makers, academics, and virtually all media seem to be engaging is off-point and should be scrutinized intensely by true value investors. Their accounting identities are all wrong. Balance sheet growth is not sustainable prosperity or even a viable form of economic cyclicality. Opportunity lies in fading this consensus. Public equity valuations will always be debated, as they are being debated now. Today, however, unlike any time in memory, investing one’s current purchasing power based on a metric of relative nominal valuations, compared to history or to each other, seems a fool’s errand. Their valuations and returns are being judged without regard for the purchasing power of the currencies in which they are denominated at a time when all monetary authorities must cheapen their currencies. To maintain or increase wealth, nominal asset prices must appreciate above the level of dilution of the underlying currency. Speculating on or hedging against fluctuating exchange rates does not address this issue. A relatively strong or weak Dollar, Yen, Sterling, Yuan, Euro, etc. merely gives global businesses and shareholders temporary advantage or disadvantage in terms of mark-to-market flows, not in terms of sustainable wealth (unless those flows are subsequently converted to unencumbered capital). A business that produces in a cheap currency and exports for consumption in a stronger one shows higher revenues and earnings in its home currency. The employees of that business are paid and can consume in their cheap currency, as long as they consume at home. All’s well if they do not travel abroad and if the domestic prices of the goods and services they consume are not impacted by the rising global cost structure the cheap currency strategy produces (so all’s not well, beyond the initial stimulus). Beggar-thy-neighbor currency wars can be good politics and good for management bonuses and correctly speculating traders, but they are poison for savers and investors seeking wealth creation. Investors that own shares denominated in weakening currencies are implicitly betting on stable or increasing earnings AND a stable or increasing currency relative to the global cost of goods and services. Those investors expecting to use their profits for future consumption must convert their shares back to stronger currencies or hope their costs-of-living do not rise with global price inflation, sure to follow. As implied above, when it comes to production and currencies there is one critical issue often overlooked by investors and economists: aggregate demand for goods and services does not by itself drive production, consumption and the general price level. Rather, aggregate demand in relation to the supply and demand for money and credit determines production, consumption and the GPL. Most political economists of the current era seem to assume that global production costs and the price of global resources will not rise with their intrinsic values, even as currencies are being diluted. I believe they are wrong, and long history would endorse that belief. This argument is also supported by logic. Ask yourself this: why don’t all central banks simply triple the quantity of their currencies tomorrow so that global economies can boom? The answer is because real economics matter and real economies run on value and incentives, not on price management. While tripling the quantity of money would ostensibly triple NGDP and the price level for both consumers and producers, the intrinsic value of resources and production would not change. 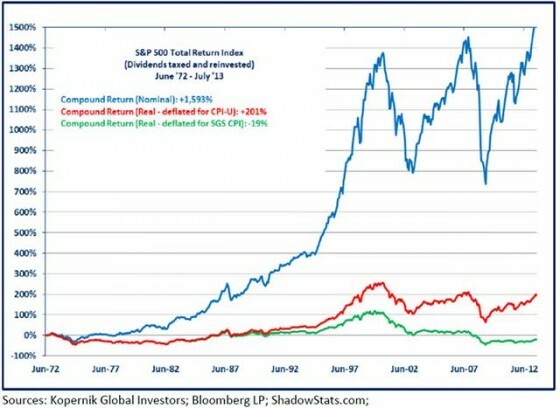 Tripling the money stock would, however, diminish the burden of repaying debt obligations, which is why we should continue to expect significantly increasing monetary inflation, suddenly increasing price inflation (which might even be promoted by monetary authorities), and purchasing power dilution among all currencies. It seems clear that the likely outcome is a systemic default on systemic debt in real terms so that nominal defaults can be avoided.Inflation has always been the political solution throughout history, and current trends and logic support its future endorsement. In the end, purchasing power wealth is controlled by those that produce and by those that fund production. Ownership in scarce resources and in capital producing businesses around the world must maintain their purchasing power value regardless of which currencies they are denominated in or how many monetary units it takes to own them. And so it is apparent today that claims on demand-inelastic global resources and production are the ultimate sovereign currency, regardless of their provenance. That’s where we think substantial alpha in the equity markets resides today.